Have you ever wondered why so few people have mastered the concept of work-life balance? If you find it more challenging than ever to juggle the demands of your job and your life, you’re not alone. To learn more, listen to our full audio podcast or continue reading. Work-life balance means something different to each individual, which is why you need to find the right balance for you. People get stress trying to balance their work life with their personal life. Work-life balance is difficult because many of us experience heavy workloads and long work hours while managing personal relationships and family responsibilities. If we don’t manage the imbalance between work and personal life, consequently, stress weakens our immune systems. Over time, this makes us more susceptible to illness. According to Digital Marketing Strategist Ben Weiss, several successful organizations have realized improved work-life balance results in increased morale, staff members feeling more appreciated, fewer sick days, and more productivity. This also has the added bonus of greater employee retention which reduces recruitment costs. Make the most of time on the job and set priorities. Prioritize your work in order to be more productive. Working smarter gives you better control over your work. The latest research shows that the more control we have over our work, than the less stressed we are. If possible, discuss flexible schedule hours with your manager. Research shows that employees who work flexible schedules are more productive and loyal to their organizations. When you are at work, take your break and lunch away from the office/work area. Go outside, take a walk, and get some fresh air. When you return, your mind will be clear, refreshed and therefore you can focus on the important issues of the day. Know when to ask for help. When you find yourself overwhelmed with your assignment, be honest with coworkers or your managers and ask for help. When you make a mistake, don’t be too hard on yourself. Sometimes, we can be our own worst critics. If your company offers Employee Assistance Program (EAP), use their services. They provide guidance on issues like childcare and eldercare. The majority of your time is spent at work. After you leave work, focus your attention on your life and family activities. Don’t take work home. Divide your time and energy between work and personal life. Unplug. Turn off all electronic devices including cell phones, computers. The technology that enhances our lives also contributes to increased stress levels. Take control of your personal life and enjoy. Focus on happiness. Enjoy the time you share with family, such as vacation, and live life to the fullest. Spend time and energy on family and home activities. Schedule regular fun activities with the family. Plan them around your work schedule and do not change them. Do completely family-oriented activities that do not involve work. Take your vacation. Vacation time is a benefit you have earned. Take it. Adjust your schedule to allow for more time. If household chores or errand are overwhelming, obtain outside assistance or pay someone to help you in this area. For example, pay someone to mow the lawn or clean your house. Make sure you have proper support system. Talk with friends and family. It is important to your emotional wellbeing. Take care of yourself. Eat right. Do not turn to drugs, alcohol or cigarettes to cope with stress; they will only lead to more health problems. When needed, ask for professional help. If you are persistently overwhelmed seek help from professionals. Asking for help is not a sign of weakness. Taking care of yourself is a sign of strength. Focus your time on activities and people that are fun and energize you. Whatever you put in place for work-life balance, start small and increase gradually. Achieving balance at work and in your personal life enables you to perform efficiently in both areas. We know this is a big challenge, but it is doable. And it’s worth it. 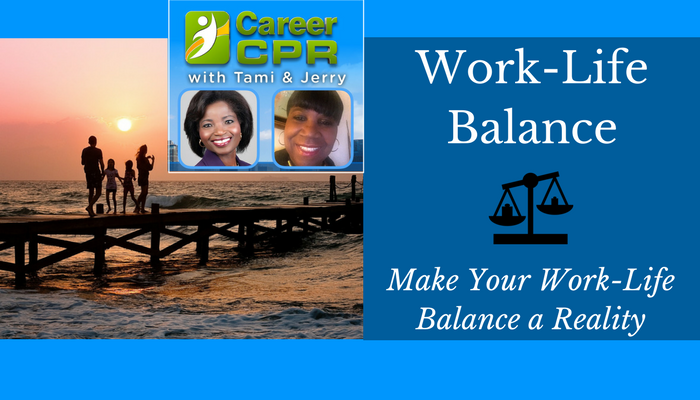 What is the most challenging part of achieving work-life balance for you? How has technology impacted your work-life balance? What have you changed in your life to improve your work-life balance? We’d LOVE to hear from you. Please share your feedback below! Subscribe on iTunes for more tips and tools to increase your productivity and become a high performer in your job & life. Tami helps businesses and corporations increase their bottom line through employee retention. She holds workshop activities to increase employee job satisfaction. Her perseverance and tenacity is a true story of life-changing courage. Tami shares this story with others to inspire, encourage, edify and embolden them toward a life of fulfillment and contentment. A thought-provoking and insightful speaker, Tami delivers passionate, power-packed informational presentations that teach others how to increase their own happiness at work, create a positive workplace environment, and build a successful career. Jerry Cox is an RN, MSN, CRRN, CPI, Staff Nurse, Manager, Clinical Instructor, CPR Instructor, and Podcast Co-Host. She attended St. Xavier University where she studied nursing. She is devoted to her lifelong career in her profession. Jerry is highly recognized for encouraging individuals to reach their professional goals, fulfilling their ambitions and obtaining satisfaction in their careers. She has obtained several Awards (Nancy Holt Awards and Magnuson Awards) in recognition for her outstanding efforts and contributions to her team in making the organization the best in healing and hope. Jerry worked on various committees (such as Clinical Ladder Committee, Research Committee, Policy & Procedure Committee, and The Magnet Steering Committee).